I recently had the pleasure of sampling some delicious and intriguing fromage with the esteemed Goudacris. We found ourselves in the heart of San Francisco's rapidly-bougifying Mission District and remembered that there was a new cheese establishment in town. 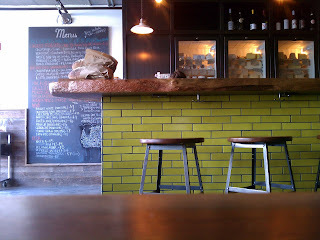 this place has just the right amount of trend: a tall chalkboard serves as the day's menu; a sleek, chartreuse tiled bar complements the otherwise minimalist décor. There is also some compelling chalkboard art involving sheep whose fleece is made of people's names. The spot is best described as a “cheese cafe” that also happens to be a cheese shop. They have an extensive list of fromages that can be purchased by the pound, but most patrons seem to come for the cheese flights, cheese sandwiches, and adult beverages. Gouda and I settled on the “Pacific NW” cheese flight, a glass of Periscope rosé (on tap, of course), and a bottle of Scrimshaw. Our flight was introduced to us by a charming gal who seemed to really know her fromage. The flight contained three fromages (all goat), three exciting cheese knives, some baguette slices, green apple slices, and cornichons. The first cheese was “Up in Smoke”, an award-winning goat cheese from Oregon's central coast that's first smoked over alder and hickory and then wrapped in smoked maple leaves. Very impressive. It looks like a delectable fromage dolma, and I felt like a kid at christmas as we unwrapped our little fromage gift. Up in Smoke's taste was described to us as “bacony”, but I found its flavor to have more of a smoked ham or smoked turkey quality. Then again, I'm a vegetarian, so perhaps I shouldn't be trusted on this. What I do know is that this cheese was delicious. Some chevres tend to be a bit dry, flaky, and crumbly (which can end up being quite messy), but this goaty fromage was creamy and spreadable. We sampled it plain, with bread, and with apple. The apple-fromage combination was simply delightful – the pungent, smoky creaminess (or was it creamy smokiness?) was complemented perfectly by the apple's tart crispness. yum. The next leg of our fromage journey took us to Bend, Oregon for the “Pondhopper”, a semi-hard goat cheese. Its claim to fame is that it's washed in a local beer, which is meant to give it a hops-y flavor. Here's a review of the process (and the fromage). This cheese was considerably more subtle than the first, but this is not to say that it wasn't complex. Au contraire! For me, eating the Pondhopper was like eating several cheeses in one, each flavor arriving in succession like Wonka's three-course dinner gum. I initially got hints of monterey jack, followed by a tangy, almost brie-like taste, and then a more pungent, grassy flavor. Outstanding! I felt that the beer notes were most prevalent in the final stages. This is an extremely compelling cheese that I hope to enjoy again soon. It's supposed to make an excellent mac-and-cheese, but I think its subtlety may be better enjoyed in small slices, especially at $39/lb. Zing! The final stop on our fromage flight was a semi-soft Washingtonian goat cheese called “Off Kilter”, which I've just learned is washed in a Scotch ale. This is an important detail, because both Goudacris and I seem to have (mis)heard our server tell us that the cheese was washed in scotch. Wishful thinking, perhaps... as a scotch lover, the prospect of a scotch-fromage marriage made me almost giddy with delight. Needless to say, the fromage tasted nothing like scotch, but it seems rather unfair to hold that against it. And yet, all things considered, I still feel that this cheese was underwhelming. It had a pleasant, earthy taste to it, but it paled in comparison to the first two fromages. I've sampled quite a few beer/ale-washed cheeses in my day, and this one was my least favorite. A bit too subtle, perhaps, even for a refined cheese-taster such as myself. All in all, it was a delightful, fromage-filled afternoon. 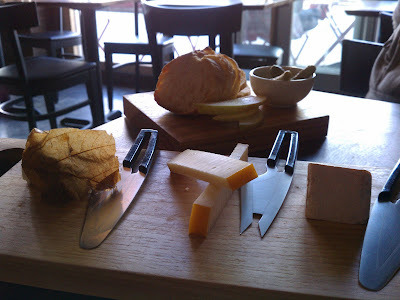 Someday soon, I'd like to go back to Mission Cheese and try their "cheesemonger" flight (a fromagey spin on the "chef's selection") and perhaps a sandwich. I'll be sure to give a full report. Chedda- I've very intrigued by the apple-fromage combination. I certainly haven't tried that, and definitely not with chevre. I have been keeping my eyes out for a good, creamy west-coast chevre to compete with the excellent cheeses from Cypress Grove chevre. The Up-in-Smoke sounds like a great one to give a try. I'm curious how the scotch-fromage was that underwhelming - I don't think I've yet had a liquor-washed cheese and am very curious about the flavor.